NATURAL HABITAT AND PREFERRED SITE: West Texas in rocky, limestone soils, dry areas, and well-drained situations. Grows in areas that receive 25 inches or less annual rainfall. It will grow in full sun in a variety of soils in Texas landscapes. IDENTIFICATION INFORMATION: Beautiful small or shrubby oak (shin oak) that grows to a maximum height of about 40 feet. The leaves are shiny green on top and fuzzy white underneath. FLOWERS AND FRUIT: Male and female flowers (catkins) are ¾ to 1 ½ inch long, on the same tree (monoecious), acorns are born annually. Acorns are hairy, oval and brown and lustrous. BARK: Light gray and smooth when young becoming darker and heavier textured with age. FOLIAGE: Leaves are alternate, persistent to semi-evergreen, shiny and smooth on top and fuzzy white underneath. Beautiful foliage. 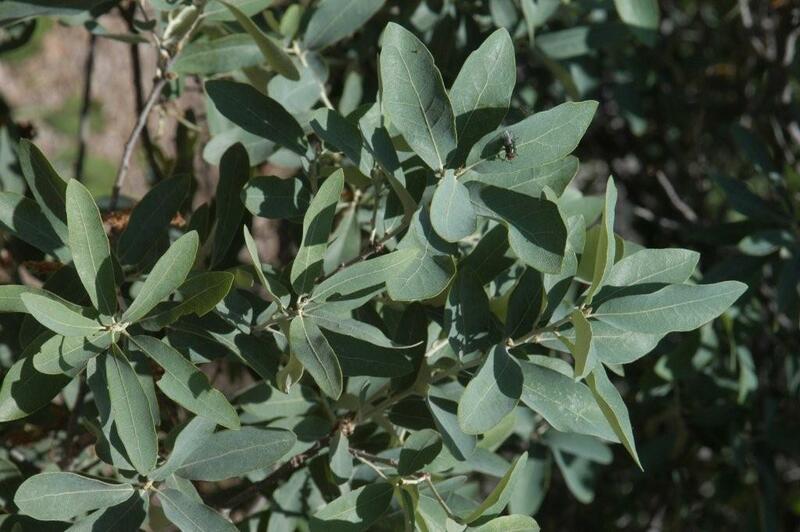 Leaves have an overall blue gray-green look. CULTURE: Drought tolerant plant and easy to grow in a wide range of well-drained soils. It tends to sucker into groves and can become somewhat of a problem if you only wanted single stemmed trees. PROBLEMS: Few although this tree must have good drainage, it cannot stand wet feet. PROPAGATION: Grown from acorns like all oaks. Plant just after they release in the fall. 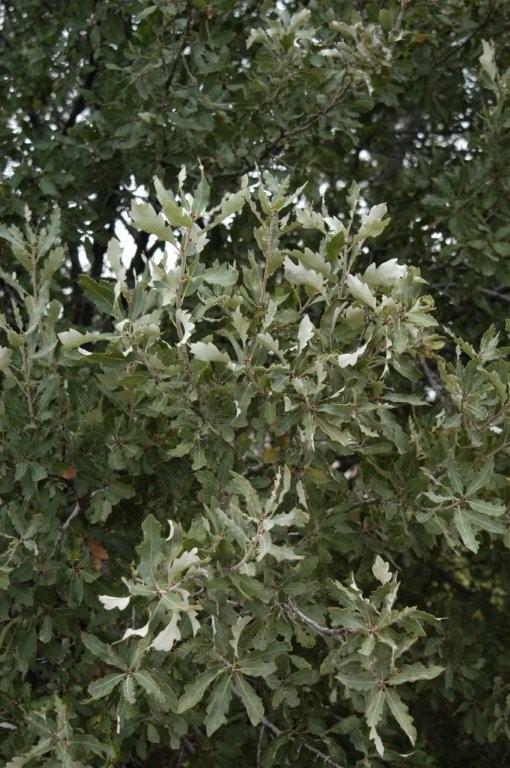 INSIGHT: Gray oak (Q. grisea) is a similar tree that also grows in the dry, gravel soils in the West Texas mountains, but its leaves are different. They are gray green as well but hairy on both sides.